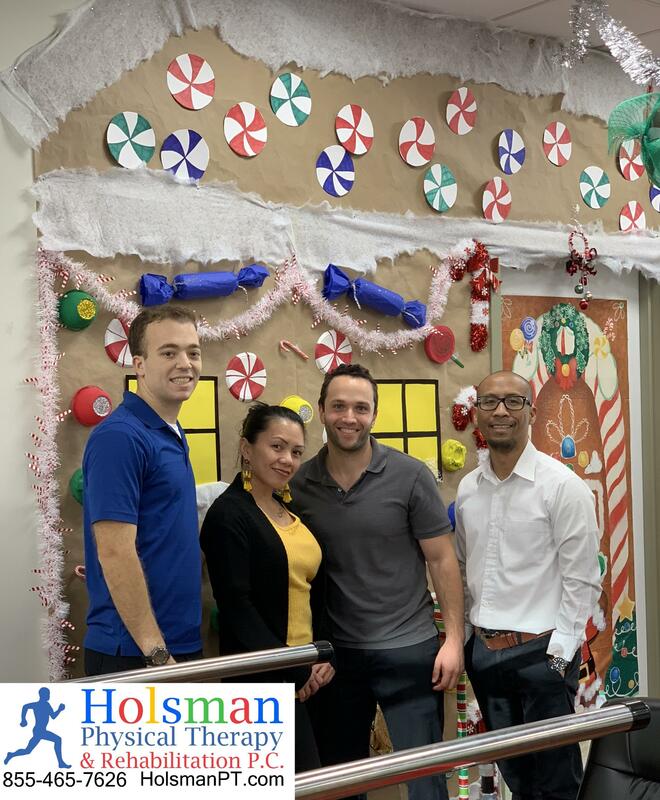 Our Team members at Holsman Physical Therapy in Caldwell, NJ are not only excellent at what they do as a treating clinician, they are also extremely creative! Caldwell NJ: Holsman Physical Therapy and Wellness P.C. Welcome to Holsman Physical Therapy and Wellness PC at Caldwell, NJ. The Caldwell, NJ location of Holsman Physical Therapy and Wellness PC is distinguished for its comprehensive and effective range of geriatric physical therapy, occupational therapy, chiropractic services, strengthening and personal training, speech therapy, sports therapy and massage therapy. We accept all major insurances and provide complimentary transportation for our clients in Caldwell, West Caldwell, North Caldwell, Essex Fells, Roseland, Livingston, East Orange and West Orange, Verona and Montclair, NJ. When physical impairments, injuries or limitations impact your quality of life, the physical therapists with Holsman Physical Therapy and Wellness PC in Caldwell, New Jersey are there to help. Our full array of physical therapy services includes post-surgery rehabilitation, treatment of musculoskeletal issues, balance training, postural evaluation and neuromuscular re-education, gait training and vestibular rehabilitation to help people who are at risk for falls, therapeutic massage, gait training and ambulation issues, mobilization therapy focused on muscles ligaments and joints, and pain management. Among the special therapeutic modalities we use to address pain issues are Therapeutic Exercise, Manual Therapy, Spinal/Joint Mobilization, Transcutaneous Electrical Nerve Stimulation (TENS) which sends small electrical pulses through the skin via electrodes being placed on the body needing treatment, Ultrasound, which sends high pitch sound waves through the body to produce gentle heat to muscles to reduce spasms, inflammation and pain, Laser, and hot/cold therapy. Heat is used to increase blood flow and relax muscles. Cold is used to reduce muscle pain, spasm and inflammation by slowing down circulation. When physical limitations threaten your independence and ability to care for yourself, do your work and enjoy your leisure activities, the occupational therapists with Holsman Physical Therapy and Wellness PC in Caldwell, New Jersey bring their expertise to help you. Our speech therapists assess speech, language, cognitive function and swallowing skills of designated patients at the Caldwell, New Jersey location of Holsman Physical Therapy and Wellness PC. The chiropractic therapy provided at Holsman Physical Therapy and Wellness PC in Caldwell, New Jersey will allow the chiropractor to perform adjustments to your spine or other parts of your body to correct alignment problems and reduce pain. In addition to chiropractic therapy, we are distinguished at Caldwell, NJ for our back decompression treatment, a gentle technique that relieves pain and promotes healing. We encourage massage therapy for our patients in Caldwell because it improves circulation by bringing oxygen and other nutrients to body tissues. It relieves muscle tension and pain, increases flexibility and mobility, and helps clear lactic acid and other waste, which reduces pain and stiffness in muscles and joints. The massage therapist uses long, smooth strokes, kneading and other movements focused on superficial layers of muscle using massage oil or lotion. At Holsman Physical Therapy in Caldwell, NJ, we know that a physical ailment can result in mental and emotional suffering as well. That is why we employ a talented, experienced and caring team of physical therapy professionals to recognize what is happening to your body and help you.